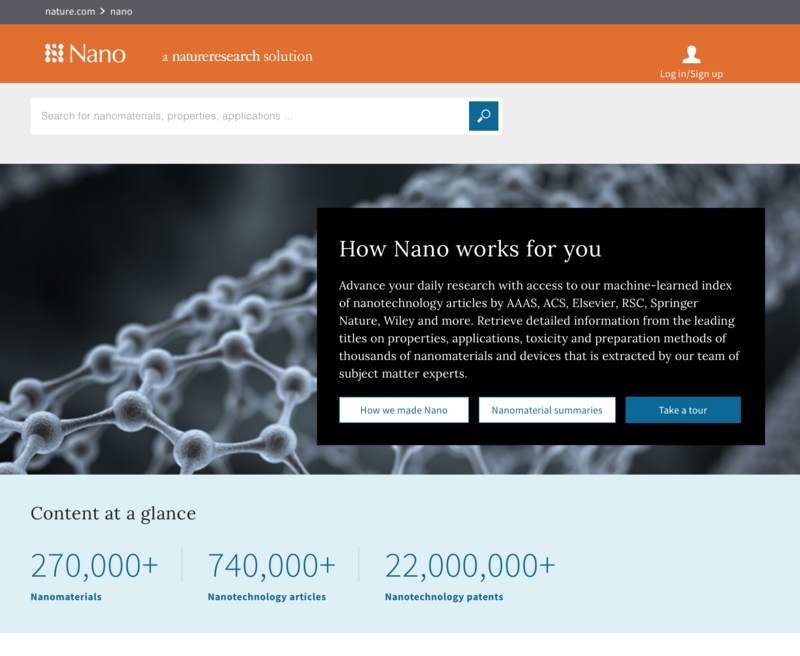 Nature Nano is a scientific database, much like Springer Materials, but providing information, articles and patents related to the nanomaterials and nanotechnology disciplines. Branded under the Nature side of Springer Nature, it attracts a more corporate audience that Springer Materials’ academic one. I was brought in at the birth of the product, when the team needed help in working out how the product would function, and then later when they needed help in producing an additional database of patents. I helped the team to research and understand their audience in both cases, and build solutions that suited the needs of their users. I was originally asked to join the Nano team when the product was first being considered. Springer Nature had a series of sources of nanomaterial data, but needed help and guidance on who would make use of the data, and what they required from it. My job was to conduct research to understand those needs, and to help the team to understand it while planning how to build the product. Describe to us what you do in your everyday work? – this helps us to get an overall picture of the user’s work and environment, as well as possibly identify opportunities to use the product which we had not identified before. What do you do with the data when you have it? – here we explore the best way to provide the data, and whether we need to facilitate using the data for other purposes, such as transferring it to another form of storage, taking it away to work with somewhere else, or inputting it into another facility to manipulate and work with. What are the challenges you face in your work? – asking this allows us to understand opportunities where we might be able to make their process easier, and help the user with our product. Users don’t have time to read everything – a common problem in the scientific community, data is provided in academic papers and journals, making it very hard to locate without having to digest the entirety of the paper (I refer to this problem as “drinking from the fire hose”). Information needs to be reliable – there are many sources of data out there, some of which are questionable. Users need to be confident that the information that they are using is trustworthy. This also has a cost impact, as libraries cannot afford to provide all information sources to users, so they need to be sure that the resources that they are using are reliable and suitable for their users. Data needs to be portable – users want to be able to take the data away with them and work with it, and would appreciate a way of being able to check information quickly and easily. In order to share this information with the production team and stakeholders, I created a number of personas, based upon the information I had found during the user research, which helped define the different types of user, and their requirements for the product. As well as having direct users, I also included a persona for a “buyer”, a user type that is responsible for purchasing the product for their institution, but not using it every day, as their needs were also important to consider when creating the product. These personas were not only created, but kept up to date as more information as gained during rounds of user research and testing (see my introduction to user experience and testing to explain how regular user testing helps to ensure that a product is on-track with user requirements). 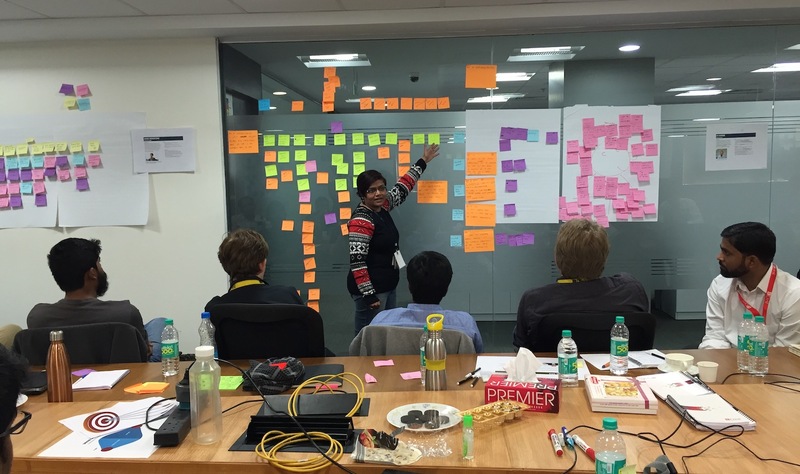 We then held a week-long inception meeting in our office in Pune, India to discuss and plan how to build the product, including the production team and stakeholders for the project. 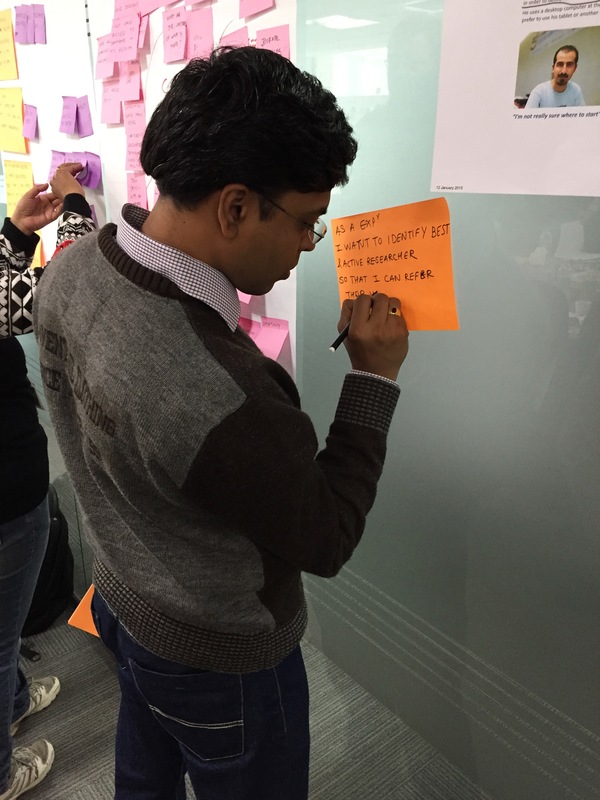 I started by giving a presentation of all of my research findings, including the personas and quotes, and then involved the team by getting them to explore the information that I had given them in a series of workshops, devising ways to address the needs of the users in the final product. Breaking up into groups, the team wrote out user goals, and then began to build user journeys to explore how they could approach those problems. We then asked them to present their solutions back to the other teams, so that they could be understood, challenged and discussed. This was then made into a working prototype, starting with a very simple version, using static HTML pages as examples, so that we could then test and explore the concept with users. 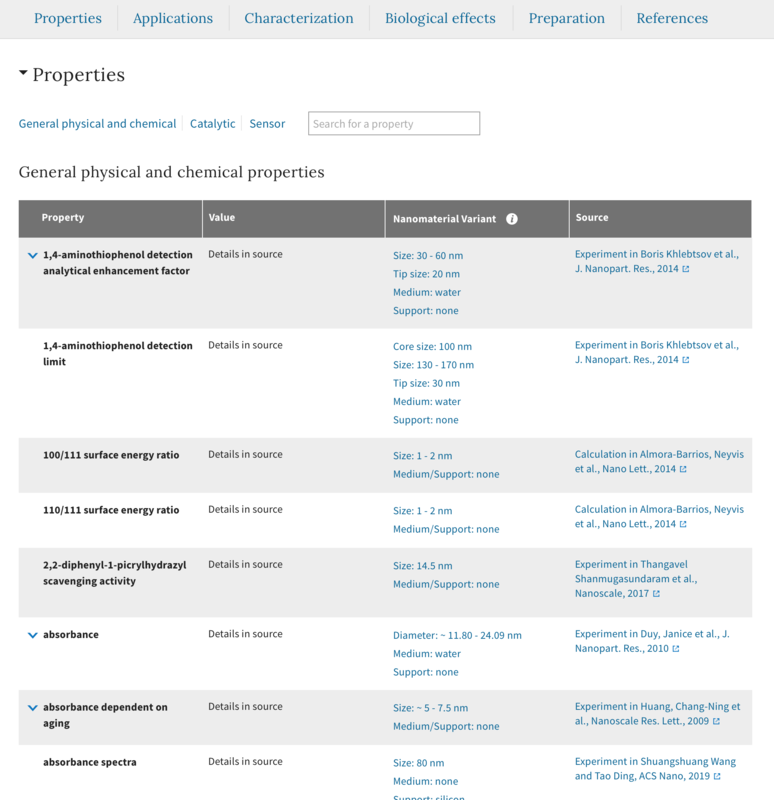 Example page on Nature Nano, showing the amount of details provided for gold nanoparticles. See the page live here. Having worked on other products for some time, I was brought back onto the project in October 2017, to assist with adding a new and significant dataset to the product – the ability to research patents related to the nanomaterials that were already there. The team had already started by building a prototype, allowing me to explore the data with users, and get their feedback. Before starting user testing, I explored the product myself, and built a rough idea of some of the main tasks carried out, as well as some of the questions I would ask the users. 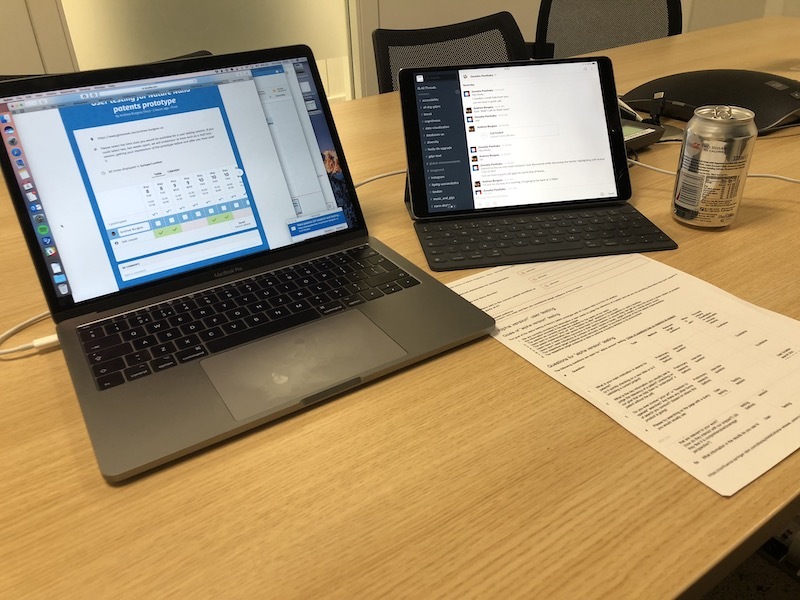 I then organised the testing sessions, and, in order to involve the team even more closely with the research, I asked them and stakeholders to take part in the video calls by making notes of the session. I was the only one allowed to talk to the users, asking the team to mute their microphone in order to avoid confusion in the session, but allowing the team to communicate with me over a Slack text conversation, so that I could ask questions and raise points on their behalf. 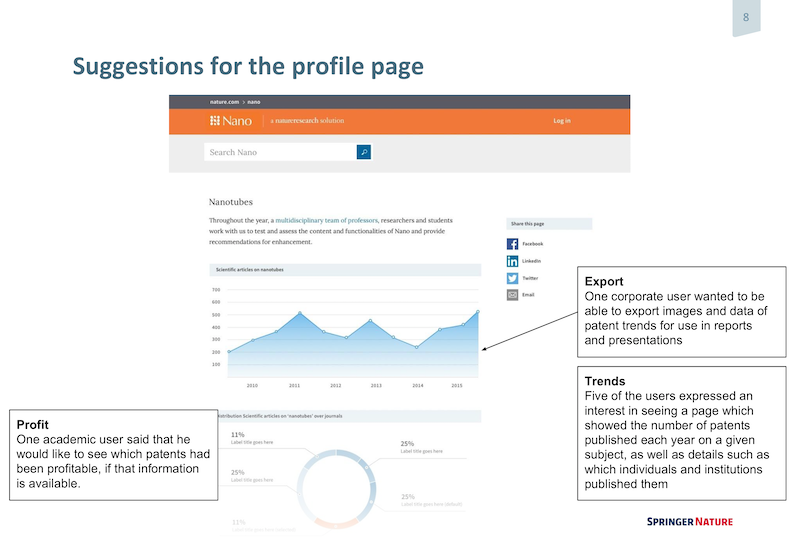 Users want to be sure that they have all the information – users often seek out patent information in order to identify opportunities, possible areas where they can benefit from creating new patents. They therefore need to know that they have all the patent information to hand, as finding new information later could cause difficulty. I also communicated these findings in a series of presentations for stakeholders, outlining feedback from the users, and helping the stakeholders make decisions about how to improve the product. Provide a way for users to search for patents, using a range of criteria, and even provide a guided tour on how to use the product comprehensively. Examine patent claims in the search snippet, allowing users to quickly review the remits of the patent, before reading the whole patent document. Save and return to their searches, to keep up to date on the latest developments since their last search. The patents prototype has now been added to the main site, and is working as a beta. It has already gained interest from various corporate institutions, indicating that the customer base may well grow because of our efforts. For more information about this project, or to discuss this further, why not get in touch? Please note, site content may have changed from examples shown here, and some features may not be available due to the paywall.